MOHALI: England batsman Haseeb Hameed’s India tour ended Tuesday with skipper Alastair Cook confirming he will return home to have surgery on his injured hand. Hameed — who made his debut in the first Test in Rajkot — was hit on his left hand by a rising delivery from Indian seamer Umesh Yadav in the first innings at Mohali. But the teenager played through the third Test with a broken hand — though his valiant effort of 59 not out in England’s second essay could not save the Test for the visitors, who now trail 2-0 in the five-match series. “He has got a broken hand, needs a plate within it to fix it. He’s out for the whole tour, he is going home. A replacement would be called,” Cook told reporters after the team’s eight-wicket loss. 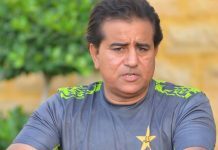 Hameed, nicknamed “Baby Boycott” for his unflappable style of play, came to bat at number eight on the fourth day and put in a strong performance during his 156-ball stay. “To play like that (with an injury), that was a very special knock. Of course he devised a style to not bring the injured finger in play but (he) would have felt the vibrations,” said Cook. The Lancashire-born player won the hearts of many fans during his short India stay with Indian skipper Virat Kohli terming him “a future England star”. “Wish him a speedy recovery, showed great character for a 19-year-old at this level,” Kohli said. Hameed put on 41 runs for the last wicket with James Anderson before the Indian fielders ran out the number 11 batsman. “(He) showed great maturity to play with a tail like that… Great prospect for England and definitely going to be a future star in all forms if (he) persists with his skill,” said Kohli. The two teams now have a bit of break before the action shifts to Mumbai for the fourth Test starting December 8.